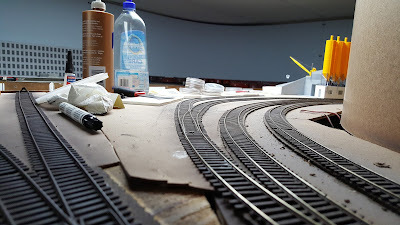 A recent post on the Canadian Model Trains post asked about curving commercial turnouts. 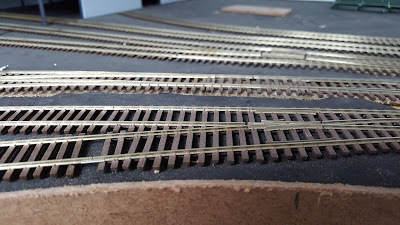 I can only comment on using MicroEngineering turnouts because that's all I have on my layout. MicroEngineering turnouts specifically note that this is possible in their instructions. Here's how I've been using them, with some additional modifications. Unfortunately the turnouts are all installed, so I can't show you the the underside of the webbing, etc, but here's the basic process. 1. Curve toward the diverging route. This will make the radius on the diverging route sharper. ME only manufactures #6 turnouts. You can curve it the other way, which makes more of a wye than a curved turnout and doesn't work quite as well. 2. Leave the areas through both the hinged points and the frog straight (it works better and is prototypical). In other words, only curve the section between the frog and hinge, and the portion beyond the frog. 3. 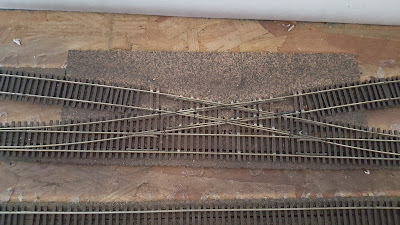 Cut the webbing on the outer rail of the curve, along with the inner tracks, leaving the webbing intact on the inner rail only. I cut the webbing between every other tie. You can do all of them, but the more you curve the turnout, the more of a gap you'll get between the diverging rail and frog. In addition, I make a few other modifications. First I try to eliminate the short sections of rail just past the frog. To do this slide the short pieces of rail out of the turnout. 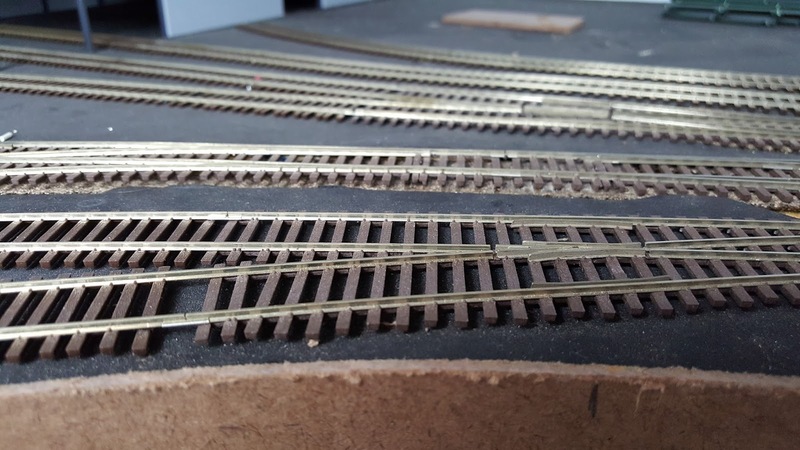 Then remove the ties from the next piece of track, and cut the main rail short enough to allow the other rail to reach all the way to the frog (leaving a gap of course to avoid a short). This eliminates a joint and the need to solder a feeder to this small section of rail. Notice that the short pieces of rail to the inner tracks left of the frog have been eliminated. Where needed, you can nest the next turnout up to the frog. 1. Prep the first turnout by removing the small piece of rail after the frog on the appropriate route. 2. Measure the outer rail on that route to determine the correct length. Using track cutters, press the rail very hard against the ties on either side of your cut, and cut the rail to length. 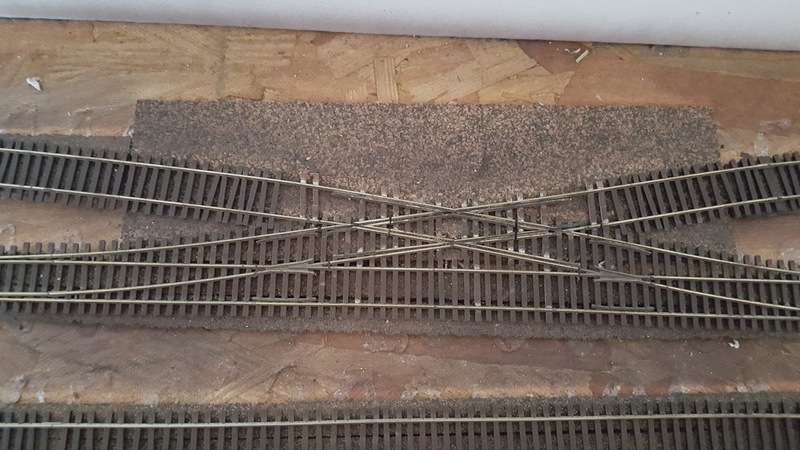 This will prevent it from lifting the rail when you cut it, which will at best mean that you have to figure out how to reassemble the turnout, at worst it will break off all of the scale spike heads that hold the rail in place and you'll need a new turnout. 3. Cut out all except the last two ties behind the frog. 4. On the second turnout, remove the first two ties, then slide the rail into the last two ties on the first turnout. Solder the outer rail to strengthen the turnout and maintain electrical continuity. The points of the middle turnout is much closer to the frog than the points of the turnout on the left. Using this same technique, you can create crossovers. The length of the turnout beyond the frog places the track centers at about 2". This is less than many people use, but more prototypical (still too wide). So if you're going to use this approach it's best to work it into your layout plan from the start. 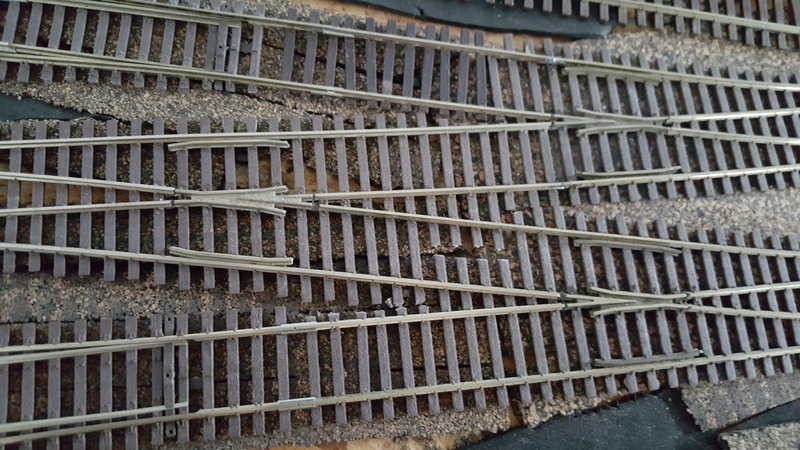 In this case, you'll leave half of the ties on the diverging route on each turnout so you can slide the outer rail from each turnout into the frog on the other turnout. You'll also need to shorten the ties between the two turnouts, some all the way to the edge of the tie plate to clear each other. I don't worry about the gaps between the middle of the ties. I fix that while ballasting. Note that the middle two turnouts are also nested end-to-end, eliminating the short sections of rail. The outer two turnouts are not nested, and those sections of rail remain. And here are two nested back to back with a handlaid diamond crossing. Still have a few ties to add. You might be able to tell that some of the wing rails is an experiment in using CMVW plastic ones from their turnout kits. Awesome primer/description on how adaptable ME turnouts can be. Couple of quick observations since I/we've started doing this: 1) make certain you don't attempt to curve anything between the end of the points (the pointy end) and the frog. 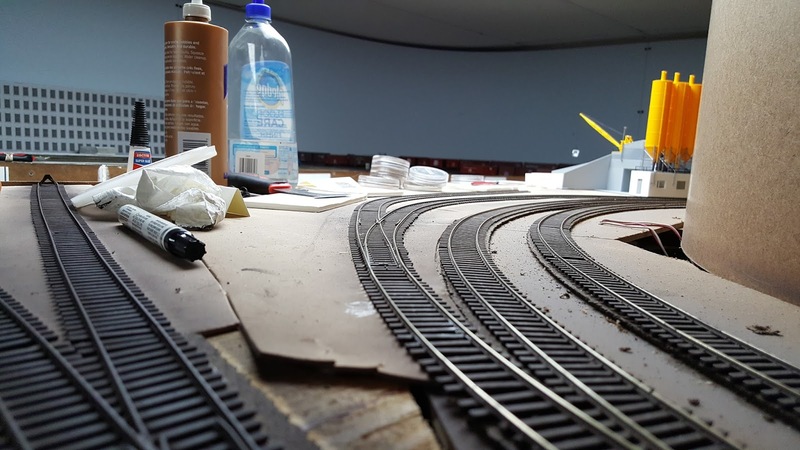 I did that in an attempt to curve a turnout to the extreme and it works ok for diesels but not for steam or anything with a long rigid wheelbase (i.e. 6-wheel trucks on passenger cars) - This is because even if the rails are curved, the points continue to be straight and cause derailments; 2) RE crossovers: be aware that placing Midwest Cork Roadbed side-by-side for parallel tracks would result in track centers that are greater than 2" if you use the "split" in the roadbed as your guide for track centers. 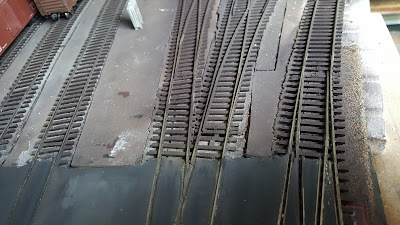 So nesting the turnouts to make crossovers as described here (resulting in more-realistic 2" centers) would prevent you from centering your track on your cork roadbed. I updated the post. It wasn't as clear as I'd like the first time - the only portion you curve is between the hinge itself and the frog, and the track beyond the frog. 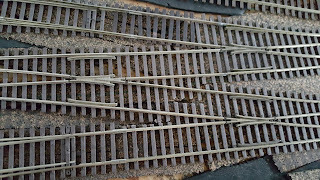 The track through the hinged points should not be curved, because the webbing and ties there hold the track in gauge.